Slide 'em. Stack 'em. Build the tower high, but don't be the player that lets it tumble to the ground! Triumph Fun Size Tumble is a scaled down version of our most popular puzzle game, and for good reason - It lures even the most unwilling guests to join the fun! Slide &apos;em. Stack &apos;em. Build the tower high, but don&apos;t be the player that lets it tumble to the ground! Triumph Fun Size Tumble is a scaled down version of our most popular puzzle game, and for good reason - It lures even the most unwilling guests to join the fun! 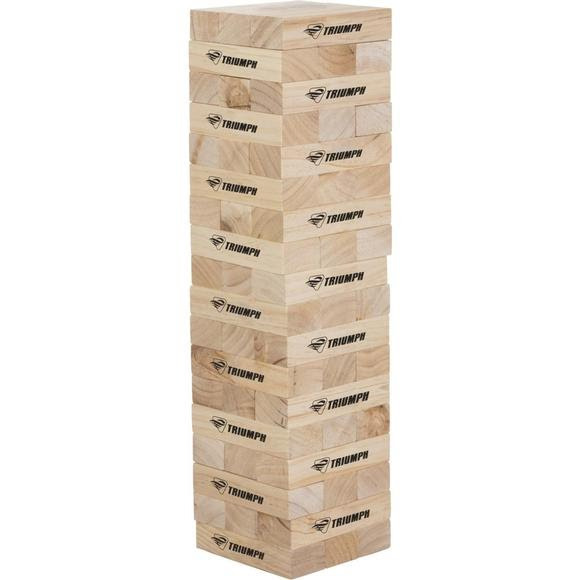 Comprised of 54 New Zealand pine wood blocks, game play is seemingly simple: On a player&apos;s turn, they must remove a block from anywhere BELOW the highest completed story. The player then stacks it on top of the tower (being very careful not to knock the structure over) - all of which takes skill, strategy ... and a whole lot of luck! It&apos;s the perfect icebreaker game for your ultimate summer party. Set includes 54 wooden blocks each measuring 6" x 2" x 1.25"